A flexible, low-cost alternative to defined benefit plans. NYS agencies are required to offer the Voluntary Defined Contribution (VDC) program to eligible employees. Find out how to implement the VDC program at your agency. All New York State agencies are required to offer the VDC program to eligible employees. A VDC plan can move to different agencies with employees, who can take cash withdrawals and name beneficiaries. Compare the VDC program to defined benefit plans. The VDC program costs significantly less from the agency’s perspective than DB plans. For example, if an agency employee with an annual salary rate of pay of $100,000 has a VDC plan, your agency could potentially save $75,000 over 10 years. Employees are fully vested after just one year. DB plans generally don’t vest for 10 years. It lets employees take charge. VDC programs offer more options in every department. Employees can choose investments and authorized investment providers including TIAA, VALIC, Voya Financial and Fidelity. With defined benefit plans, the agency chooses the investments and the providers. The VDC is a new alternative to the ERS/TRS defined benefit plans. It debuted in New York on July 1, 2013. An employee has 30 days from the date of hire to enroll. 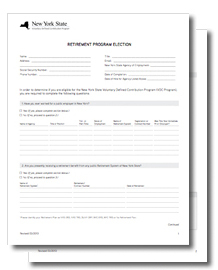 After 30 days, employees are defaulted into an ERS/TRS defined benefit plan. TIAA, the Third Party Administrator, supports agencies by offering help and guidance to educate employees. If you invest in the SUNY Optional Retirement Program through Fidelity you will be investing in a variable group annuity contract issued by Massachusetts Mutual Life Insurance Company ("MassMutual"), 1295 State Street, Springfield, MA 01111-0001 and administered by Fidelity Investments. If benefit payments are annuitized under the group annuity contract issued by MassMutual, those benefit guarantees are subject to the claims paying ability of MassMutual. New York State employees who have an annual salary rate of pay of at least $75,000 per year may be eligible for the VDC program. Employees are not eligible if a union represents them. You may not be eligible if you previously participated in a New York Public Defined Benefit plan. View additional eligibility information. An employee has 30 days from the date of hire to elect the VDC program. The following resources can help you establish the VDC program as a retirement planning option for employees at your agency. Request access to Plan Focus (PDF). Provide your agency’s payroll schedule. Notify, educate and assist eligible employees. Download the VDC program enrollment guide (PDF). 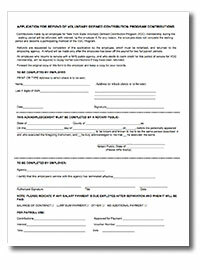 Manage your online contribution list (PDF). When you have your first new enrollee in the VDC program, OSC will instruct you on how to add/code new employee(s) in PayServ. This webinar explains the VDC program, and how to offer it, in detail. "If I start teaching at a different school, will my retirement plan go with me?" Once you master the program and make it available, it’s time to help your employees enroll. This website has in-depth information about the VDC program and makes it easy for your employees to enroll online. This video provides a brief, interactive comparison between the Defined Benefit and Defined Contributions options available to your new employees. Employees can pick up the phone and call 1-866-271-0960 to talk through their options. We can help you get your agency onboard. Please note that this information has been prepared as a general summary of the VDC option. It cannot provide you with the complete details on retirement matters. You should carefully review and research the options available to you before making a decision as to which retirement system to join. Only authorized representatives from each retirement system or investment provider are adequately knowledgeable and experienced to fully address your questions or to assist you with many of the technical aspects of their respective systems. The information contained in all SUNY publications and websites is intended only as a basic summary overview and to provide you with basic points for your consideration. You are invited to contact representatives from the retirement system in which you are interested for additional information or with specific questions about their respective system or specific benefits. Copyright © 2014-2015 The State University of New York. All rights reserved. SUNY is not responsible for the content of external Internet sites. What does the employee get in retirement? A fixed, lifetime monthly income in retirement. Balance is available when you retire, or employee can choose a fixed, monthly income through annuity investments. When is the employee fully vested? After 10 years of service. How it works for part-time employees. After more than one year of service. Find out when vesting is immediate. Can the employee choose investments? No. Yes. How much does the employee contribute? Same for both plan types. See details. Same for both plan types. See details. How much does your agency contribute? 15.5% of an employee's compensation. 8% of an employee's (subject to IRS annual contribution limits). When can the employee retire and take money from the plan? Full benefits at age 63 when you have at least 10 years of service. See additional details. No minimum retirement age. Tax penalties may apply if you withdraw money before turning 59 ½. Can it move to a different agency? No. Yes. Are loans available? Yes (up to 75% of the amount the employee contributed with a maximum of $50,000). Yes (up to 50% of employee's balance with a maximum of $50,000). Can you name beneficiaries? Yes. The employee can choose to name beneficiaries and have a death benefit in exchange for a lower monthly annuity income. (Maximum amount: 3x your salary.) Yes. Looking for more information? Read the VDC FAQs (PDF). 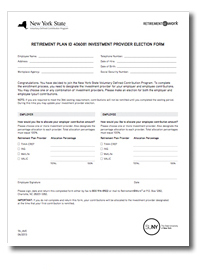 Please note that this information has been prepared as a general summary of the Retirement System Options available to eligible New York State employees. It cannot provide you with the complete details on retirement matters. You should carefully review and research the options available to you before making a decision as to which Retirement System to join. Only authorized representatives from each Retirement System or Investment Provider are adequately knowledgeable and experienced to fully address your questions or to assist you with many of the technical aspects of their respective Systems. The information contained in all SUNY publications and web sites is intended only as a basic summary overview and to provide you with basic points for your consideration. 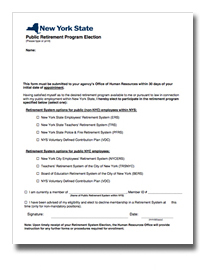 You are invited to contact representatives from the Retirement System in which you are interested for additional information or with specific questions about their respective System or specific benefits. If you are not able to ENROLL in the VDC Program online, you may contact an experienced VDC Program consultant at 1-866-271-0960, they will be able to guide you through the enrollment process. If you are not able to either enroll online or contact the VDC Program consultant you may download and complete the manual forms then submit to your benefits office. The VDC program costs significantly less than defined benefit plans from an agency’s perspective. Take this example of an employee who has a salary of $100,000. *Average contribution rate based on information obtained in the 2016-17 New York State Executive Budget. The source of this information is the Full-year 2017 Enacted Budget Financial Plan (effective May 2016) and can be found here.